OSWEGO, NY – For the third straight year, the annual Tri-Oswego triathlon successfully wrapped up another competition on the shores of Lake Ontario in the Port City. On Saturday, more than 300 men and women took on one of the several challenges the event offered. Competitors could either take on an intermediate triathlon or the sprint triathlon. 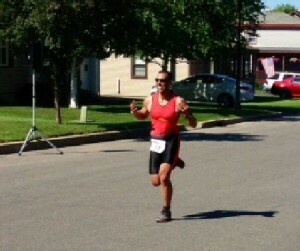 Male triathlon winner Brad DePoint celebrates his third straight Tri-Oswego victory. The race began with swimming in Wright’s Landing Marina and local police blocked off roads from the nearby neighborhood for the cycling and running portions of the race, with the finish line at Breitbeck Park. The top men’s finisher for the third year in a row was Brad DePoint from Fulton. “It’s awesome,” DePoint said of his title defense. Tri-athletes train year round to stay in shape for the grueling challenge of participating in triathlons. The standard distances for a sprint triathlon, such as the Tri-Oswego, are a 0.47-mile swim, 12-mile bike ride and 3.1-mile run. 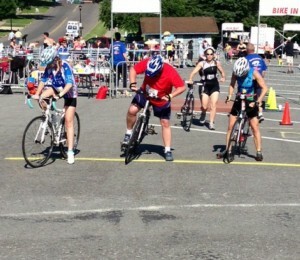 Tri-Oswego competitors mount their bikes after finishing the swimming portion of Saturday’s event. To maintain his mental edge for the race, DePoint said he keeps his preparations simple. For his race, the most challenging part turned out to be the swimming portion DePoint said. Despite the 60 degrees and sunny weather, a slight wind made the water choppy for competitors. The Tri-Oswego event was DePoint’s second triathlon event of the season. On June 2, he finished in second place at the Keuka Lake Triathlon in Penn Yan. While DePoint’s last triathlon was two weeks prior, the female winner, Sascha Scott of Syracuse, completed her last triathlon five years ago. “It was a long race,” Scott said. With a history as a runner, Scott said her plan was to focus on just getting through the biking and swimming as fast as possible since she was confident in her running abilities. Prior to her five-year absence, Scott took part in a total of five other triathlons, the Tri-Oswego is her first victory. During her five-year break, Scott began starting a family with two children, her oldest is two and her youngest is only five months old. “It was a really nice course and everything was really fun,” Scott said. The event also included entertainment for children during the race such as a bounce house and Velcro wall inside the park. Music was being played for spectators and a post-race barbecue was held as well.